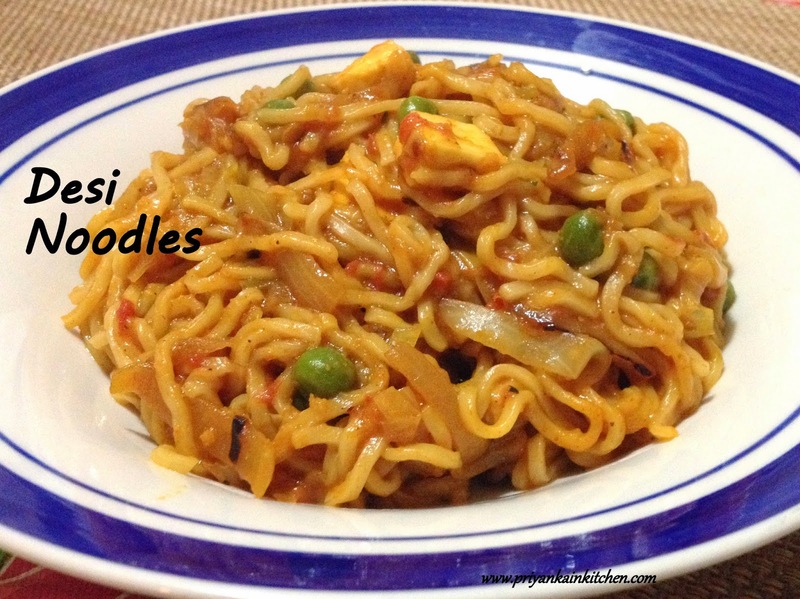 Desi Noodles, as the name suggests, is a recipe made out of commonly available noodles loaded with vegetables and Indian flavors to give it a tasty and healthy twist. All kids are very fond of Noodles these days. And since this recipe is loaded with vegetables, I can feed my child noodles without any guilt. 1 tsp of ginger paste. Boil noodles with enough water and salt until soft. Strain excess water and apply a teaspoon of oil to prevent sticking and keep aside. In a wok, add remaining oil. When hot, add onions and fry for 2 minutes. Add cabbage and again stir fry on high flame until cabbage reduces in volume. Now add capsicum, tomatoes, ginger, peas, spices and salt. Again let them cook on high for 2 minutes. You can also add a little bit of chili flakes if you like it really hot. Stir in paneer cubes and let it cook for another 1 minute on low flame. Now add boiled noodles and mix well.